For those that are regular readers, you know that at the beginning of this year my friend Alvis and I decided to do a forward-focused video project about the future of facebook. We’ve been busy since then doing interviews, transcribing, writing scripts, and building the project. Below is the article that just launched on CNN’s Global Public Square yesterday. Huge thanks to our creative team – Shane Valcich for the video work, Erica Glasier for imagery, and Mark Plattner for designing the futureoffacebook.com web site. Please help us spread the word about the project, and let us know what you think of the first focus video – Future of Facebook: Economy. The most compelling ideas have been harvested to create the first Focus Videoin a series of six. The goal of open foresight is to accelerate the rate of transmitting complex concepts in a manner that’s visually rich, engaging, and straightforward. If issues can be clarified, we can take the public dialogue to the next level of understanding. Sincere congrats on your CNN success! And your fine work with the project. They are a disastrous expansion and continuation of the financialization (i.e. the needless burdening of fundamental human interchange which is an especially critical issue when society scales)… of the direct P2P transaction as well as forestalling the facilitation of self-organized endeavors involving large numbers and small very money (the networking of transaction for various purposes). I suggest there are other critical capabilities lost as well and so propose another system. This is my view based on what I believe are pragmatic considerations with regard to problems in finance, money and credit creation and how that relates to distortions which are and will further inhibit opportunities for maximizing human potential. (The financial services sector is already bleeding far too much out of the global social organism while accelerating the concentration of this vital ‘decision technology’ (money… and I mean that in a much broader sense than campaign finance or lobbying though they do illustrate the concept). Money, finance and credit-creation are technologies needing quite a bit of work… and Facebook credits (if adopted for more general Internet financial transactions) will inhibit that critically needed evolution. Its important to pay attention to how nascent technologies develop. For example, Every time I hear people bemoaning problems with campaign finance…which are very real… I think about how ridiculous that at least a significant part of the need for so much money wasn’t solved by more diligently protecting citizen candidate’s free access to television and other media under some reasonable accommodation. That problem started 60 years ago and now we just take it for granted and bemoan “why does it take so much money to run”. This is going the same route so far… corporate, big money, and vested-interest dominated and we’ll wake up down the road and not even be aware of what was lost. I just don’t think we can keep screwing up much longer. The global transaction network may be a last opportunity to build it right. Congrats Venessa, & everyone who contributed! Pingback: Erica Glasier: Oversocialized! 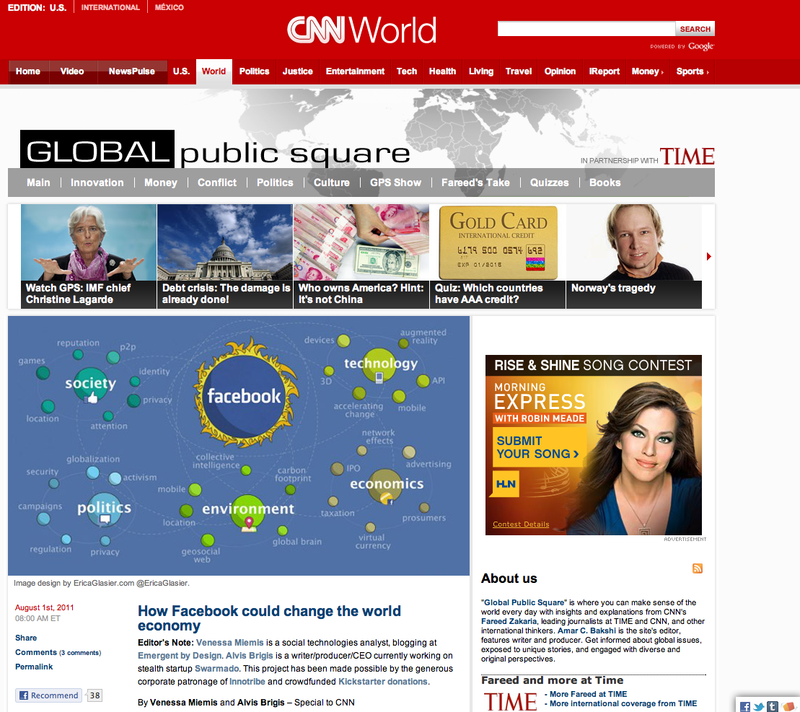 » Blog Archive » Future of Facebook project, of which I am a teeny part, featured on CNN.